While running for office in 2008, Barack Obama made many promises about fixing the economy. He pledged to end the Great Recession and change the policies that had caused it. The candidate also promised to solve many long-term economic problems, like the high cost of health care, U.S. dependence on foreign oil, and the stimulation of more technology and innovation. He kept many, but certainly not all, of them. Here are the most important promises and how well he fulfilled them as president. Candidate Obama said he would streamline regulatory agencies. The Greenbay Press Gazette’s article, "Obama Strikes Back on Economic Reform," published on September 23, 2008, said that he would focus on those banks that used funds from the Troubled Asset Relief Program. He promised to establish a financial market advisory group, improve transparency for financial disclosure, and crack down on trading activities that could manipulate markets. The Dodd-Frank Wall Street Reform Act addressed them all. On his first day in office, Obama signed an executive order prohibiting government aides from working on issues related to a former employer for two years. It also prevented them from lobbying after they left office. According to The National Journal’s "The Promise Audit," he made progress in putting meetings between government agencies and lobbyists online for the public to review. $25 billion for health, education, housing, and heating assistance. He spent $128 billion on health, $112 billion on education, and $22 billion on housing and heating. $25 billion in public works projects. He spent $83 billion. Tax credits of $500 per person /$1,000 per family. They got $400/$800 through reduction of withholding tax. Eliminate income tax for seniors making less than $50,000 per year. Social Security recipients got a check for $250. He fulfilled promises to eliminate capital gains taxes for small business investors and extend write-offs for small business equipment purchases. But Obama did not fulfill his promise to enact a windfall profits tax on oil companies. That would have given families a $1,000 rebate. The American Recovery and Reinvestment Act of 2009 though ended the Great Recession with fiscal policies that stimulated the economy. Require that all children have health care coverage. Create a National Health Coverage Exchange to monitor and provide information. Spend $10 billion to move health care providers to an all-electronic system. The 2010 Patient Protection and Affordable Care Act addressed all these pledges but one. Private companies provide health insurance instead of the federal government. You can thank Congress for that. 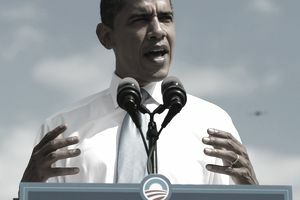 Creating a universal health care plan was one of Obama's goals in health care reform. Expand the Earned Income Tax Credit and Child Tax Credit for low-income workers. The Tax Relief and Job Creation Act increased the EITC through the 2012 tax years. Reduce self-employment tax. Done temporarily as part of the 2010 tax cuts. Implement a cap-and-trade program. By 2050, it would reduce carbon emissions by 80 percent, a volume below 1990 levels. Obama talked about it in his 2013 State of the Union address, but Congress didn't pass it. Invest $150 billion over 10 years to deploy clean technologies. The American Recovery and Reinvestment Act invested $17 billion in renewable energy tax cuts. The Department of Energy's strategy for Fiscal Year 2014 was to double renewable energy production by 2020. Reduce oil consumption by 10 million barrels of oil by 2030. How? Double fuel economy standards within 18 years. The DOE's goal was to cut oil consumption by 2 million barrels per day by 2025. Make all new buildings carbon neutral, or produce zero emissions, by 2030. Improve new building efficiency by 50 percent in 10 years. Improve existing building efficiency by 25 percent in 10 years. The DOE's goal is to cut oil imports in half by 2020 and double energy productivity by 2030. Eliminate special interest business deductions, such as for the oil and gas industry. This was not fulfilled. Double federal funding for basic research. Obama included $80 billion in research and development tax cuts in 2010. In his 2013 SOTU, he promised to return research and development spending to 1960s levels. Raise the U.S. minimum wage and index it to inflation. Obama proposed raising the minimum wage to $9 an hour in his SOTU addresses. Congress didn't agree. Establish a credit card rating system to educate consumers on risk. Create a Credit Card Bill of Rights to protect consumers from unfair practices. These included interest charges on fees and unilateral changes. Obama fulfilled these two promises with the Consumer Financial Protection Bureau. Reform bankruptcy laws for families facing a medical crisis. Obama didn't change the bankruptcy laws. He did assist families with medical costs through the ACA. Cap payday loans at 35 percent. The CFPB has proposed new underwriting standards. Encourage banks to make microloans. Ban executive bonuses for bankrupt companies. Require disclosure of all pension investments. Unfortunately, this was unfulfilled. Protect Homeownership: Obama wanted to provide 10 percent tax credit for the 10 million mortgage-holders who do not itemize. This also remains unfulfilled. Crack Down on Mortgage Fraud: He promised to create a fund to help homeowners in foreclosure to either refinance or sell their home. He fulfilled this promise by making homes affordable through the Home Affordable Refinance Program. Double funding for after-school programs. Obama created the 21st Century After School Program, which extends the school day itself. Expansion of the Family Medical Leave Act. Obama expanded it to flight attendants, crewmembers, and military families. Provision of a refundable tax credit for low-income families to help with their child-care expenses. Fulfilled. Flexible work schedules. Obama verbally supported it. The end of tax breaks for companies that outsource jobs overseas. Congress did not pass these tax breaks. All these promises were listed in candidate BarackObama.com’s "Issues and the Economy." Energy: Obama fulfilled his promises to invest $150 billion in clean technologies and increase fuel economy standards. He has repeated his 2008 pledge to eliminate oil and gas business deductions and double federal funding for basic research. Review NAFTA: Obama promised to review the North American Free Trade Agreement and other free trade agreements to protect labor and the environment. He included those safeguards in agreements with Korea, Colombia, and Panama, but did not tackle NAFTA. He repeated his promise in the 2012 campaign to end tax breaks for outsourcing. Reform Bankruptcy Laws: Obama promised to repeal the 2005 Bankruptcy Prevention Act. The Act made it harder to declare bankruptcy. Many experts now think this helped cause the 2008 financial crisis. Homeowners drained the equity in their homes to pay bills because they couldn't declare bankruptcy on their personal debt. This was how the 2005 Bankruptcy Act led to the Great Recession. Reform Minimum Wage: Obama promised to index the minimum wage to inflation. That would help low-income wage earners, the so-called working poor, to earn a decent standard of living. Congress ignored his request to raise the U.S. minimum wage to a living wage. Obama did sign an executive order that requires all government contractors to raise their minimum wage to $10.10 an hour. What Did ARRA Really Do?